We are currently digitizing our broadside collection. Before they go to the Digital Production Center, Conservation must prepare them by removing the old encapsulations and making sure they can be handled. There is additional information on this project over at the Digital Collections Blog. The Preservation Department got its start in 2000. This exhibit looks at the development of the department from its beginning to our new space in Perkins Library. The exhibit includes a time line of important events in our history, images of digital projects and conservation treatments, as well as some artifacts that demonstrate what we do. Located in Perkins LL1, outside Room 023. The Fall 2010 issue of Duke University Libraries Magazine includes an article on the steps it takes to create a digital collection. A visitor exploring one of the Duke Libraries’ digital collections is probably too engrossed in the content to think very much about how the collection got there. In fact, each digital collection is the product of a collaboration of eight to ten staff from several library departments who work together in a cross-functional team. The team begins each new project with a workplan and proceeds through a series of steps that culminates in the collection’s public launch. Continue reading the article at Duke Magazine. The latest issue of Duke Libraries Magazine has hit the virtual bookshelf with “Notes from the Underground.” The people of Preservation, Conservation and the Digital Production Center are highlighted along with some favorite projects. Today Alex and I worked together to image some pages from this Syriac Manuscript. 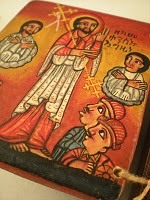 According to a hand-written note in the box, it is from the Gospel of Mark, dated to the 10th Century. Clearly it’s seen better days, but it is remarkable nonetheless. It looks to be to have survived a fire, at least the middle of the text block survived. The front third or so was burned off, leaving stubs that are still attached to the binding, but the spine has curled in on itself. The remaining vellum pages range from really brittle to fairly OK, if a little warped. It’s Manuscript Day in the lab, similar to Boxing Day, wherein we all work on flat paper repair. Today we are continuing the Broadside Project, getting these items ready for their close up in the Digital Production Center. North Carolina is this month’s project, and this little gem caught my eye. It’s from the New Bern (NC) Republican Banner, dated April 1884. Mary has been repairing the tears and losses on this broadside with Japanese tissue and wheat starch paste. After the tissue is applied, a blotter is placed on top with a weight until dry. When the digitization is complete, these will come back to Conservation for rehousing. 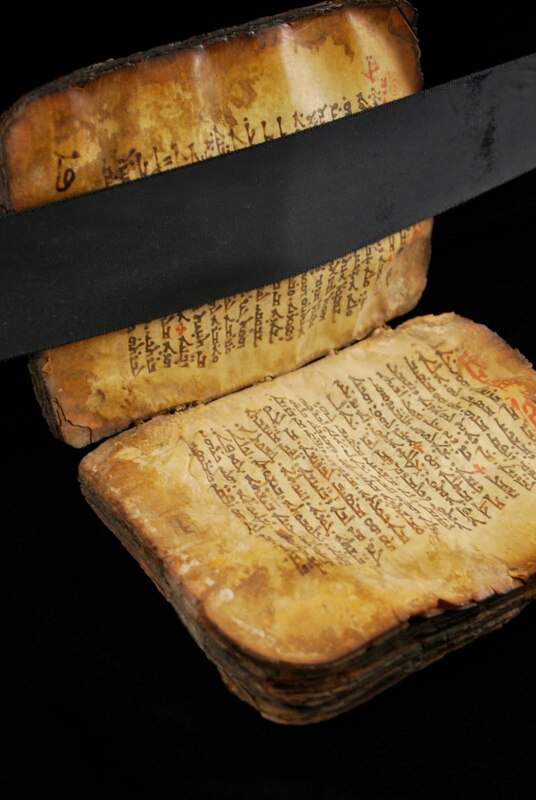 As you may know we have been working with the Digital Production Center to digitize the scrolls in the Ethiopic Manuscript collection. I’ve posted some images from that project, not the high-resolution ones the DPC is creating, but some snaps I made during the imaging of items that I found particularly interesting. You can find them in our Flickr Ethiopic Manuscript Project album. Rita Johnston, Digitization Assistant for ROAD 2.0 project has been with the department for one year. 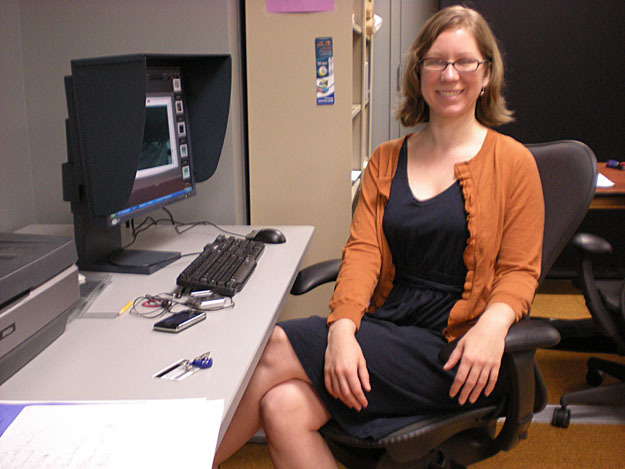 She is digitizing outdoor advertising materials described in the Resource of Outdoor Advertising Descriptions database. The bulk of materials being digitized for this project are from the OAAA Archives and OAAA Slide Library collections, but some images from the John Paver Papers and the John E. Brennan Survey Reports are also included. The project includes about 15,000 photographs and negatives which Rita has digitized, and I have about 12,000 slides which she has sent to a vendor for digitization. She uses different equipment including flatbed scanners and the Zeutschel 14000 A2 scanner for photographs and the Phase One Camera for transparent materials such as negatives. Rita is wrapping up the digitization phase of the project and will begin focusing her attention on normalization and cleanup of the metadata in the ROAD database. Since I have mostly been working with materials from the OAAA Archives, the OAAA Archives is the most interesting collection I have worked with. There is a great deal of variety in the content and types of materials in the collection. 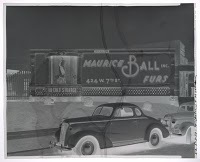 Much of the subject matter is of billboards, art designs, and other forms of outdoor advertising from the 1910s to the early 1980s. The subject matter includes food & beverages, local businesses, political propaganda, cars, financial institutions, movies, and of course, beer and cigarettes. 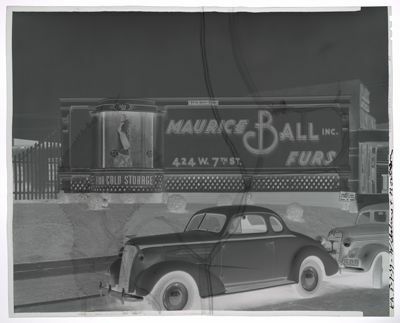 It’s really interesting to see how much billboards have changed over time, from the beautiful hand painted signs of the early to mid 20th century to machine printed billboards of later years. There are even a few interesting examples in the collection of cellulose acetate negatives breaking down. 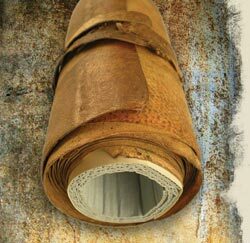 All negatives are prone to deterioration over time, and the process may be sped up if negatives are exposed to high heat and humidity. Some of the negatives smell strongly of vinegar and are warped and cracked where the emulsion is breaking down. We are all eagerly awaiting Rita’s project to be online. Thanks Rita for all of your hard work! Mike Adamo, Digital Production Developer, arrived at Duke just over five years ago. Mike graduated with a degree in Photography in 1993 after which he opened and operated a table-top advertising studio for three years in Atlanta Georgia. After that Mike worked in a stock photography studio as a black and white printer for four years. The studio switched from analog to digital photography while he was there so Mike learned about color calibration and color profiles, which was relatively new at the time. He came to Duke after working for four years as a supervisor of a digital imaging unit at a library automation software company in Virginia. As a Digital Production Developer Mike assess Library collections for digitization, creates images for high end print projects, and designs workflows for digitization projects in the Digital Production Center. He is also responsible for calibrating and maintaining the various cameras and scanners that they use in their daily operations. My favorite project over the years has been building the Digital Production Center. 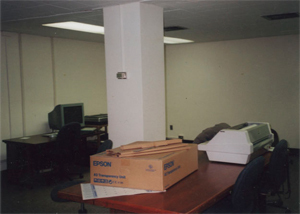 When I started on March 14, 2005, the Digital Production Center was located on Perkins lower level behind the copy room and was often used as a shortcut from the lower level to the RBMSCL. We had one Epson Expression 10000 and a BetterLight scanback fresh out of the box. The camera room had previously been a traditional wet darkroom. The sinks had been removed but some of the plumbing remained jutting out of the walls and though the tiles had been scrubbed clean the chemical stains from years past were still present. The questions at the time were: What is a digital collection? How do we represent the physical item digitally? What metadata scheme should we use and how do we capture it? While from a distance these questions seem fairly simple and straight forward once we started building digital collections we had to apply the concepts of sustainability and scalability while being as transparent as possible. Easy… right? Since then, we have moved 3 times and are now in our permanent space (I think). 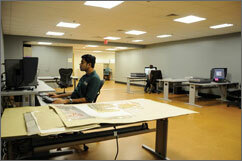 This space was specifically designed with the Digital Production Center in mind. Our air handler is HEPA filtered, the lighting is full spectrum, the monitors are color calibrated, the walls are 18% gray, the floor is cork and we have a large vault that we share with Conservation. We added another flatbed scanner, a dedicated quality control station, a P65 Phase One R-Cam, a Zeutschel 14000 A2, a SAMMA Solo video encoder a high-end light table (for digitizing negatives on the Phase One), 2 FTE, additional students and a database to track production and collect technical metadata. In addition to all of this a few months ago we added a Scribe book scanner through the Internet Archive. Our production rates have gone from 4000 + digital images the first year to a projected 100,000 digital images this year and that doesn’t include the images created using the Scribe. We have come a long way in a short time. You can see some of the work that Mike and the DPC staff on the Digital Collections Blog. Oscar Arias has been at Duke University Libraries for eleven years. Six months ago he joined the staff of the Digital Production Center as a Digitization Specialist. The DPC digitizes rare and fragile items to make them available in digital format. 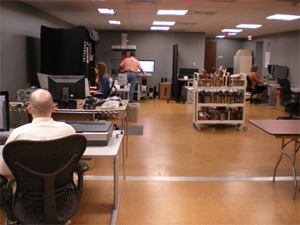 Oscar is usually involved in any of the three main stages of the digitizing process: assessing the collection to develop a digitizing work flow and digitization guide, the actual scanning or digitizing of materials (using a variety of scanners or video digitizing equipment), and the quality control phase. One of the most interesting collections I’ve worked with is the collection of papers of Marshall T. Meyer. Dr. Meyer was an American activist Rabbi who worked in Argentina in the 1970’s, during the period of military dictatorship and repression. This period gave way to what came to be known as “La Guerra Sucia,” or the Dirty War, as it came to be known, in which thousands of Argentine citizens were “Desaparecidos,” or disappeared and presumed dead, or incarcerated without trial for suspected opposition to the government. Rabbi Meyer was an activist and advocate for human rights during this dark period of Argentine history, and he personally advocated for the release of political prisoners. As part of the collection that we had to digitize, there were many original hand-written letters from prisoners and other original documents filled with gut wrenching testimonies of arrests, incarcerations and torture, and the desperate plight of family members of those disappeared or incarcerated. Note on image: Correspondence to Rabbi Meyers from Deborah Esther Benchoam, a political prisoner who was held in cell 55 of the Villa Devoto women’s prison during the repression. From the RBMSCL Marshall T. Meyer Collection.